While my Smallmouth angling reputation is not as legendary as that of others1 and my trout angling experience is more voluminus2, I know that you're likely struggling to make the switch from trout to bass and I thought I'd pass along expert-level tips to make you a better angler. Fish alone. You want all the good water. It's summer and there won't be much water in the river. You want it all. If you can't fish alone, then fish with people who will readily take direction. Point them to the thin, crappy water3. Choose the water with some structure. Smallmouth like bouldery structure from which to ambush. Except when they don't. Fish large, colorful streamers. My experience has been that the best color is Chartreuse. I like chartreuse mostly because it takes me several tries to spell it correctly when I'm typing it. I also like it cause the smallies hammer it. They also hammer white and yellow. Black and Olive work too. I haven't tried red. Red may work. Brown, probably not. But what do I know? Make long, fast strips. Nothing works better than a three foot long, fast strip action. Strip-pause-strip-pause. The strike comes at the pause. Of course, when the long strip doesn't work, then use short strips. And longer pauses. And you can alternate the pause with two strips or two pauses and a strip. You get the idea. Stick with one method but mix it up until you find something that works. Don't trout set. Smallies are the bonefish of trout water.5 Strip set. Hold on. 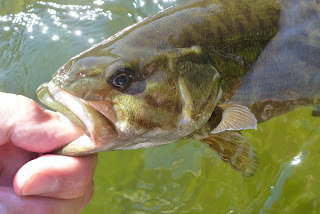 A six inch smallie fights like a trout three times its size. Foul hook that bad boy in the tail and you're in for an afternoon of fun! If you're not sight fishing, forget top water flies. Sure, watching a bass eye a popper for fourteen minutes before she hammers it is exciting. Sorta like watching grass grow but where the earthworms are aggressive carnivores hammering field mice in slow motion. But if you can't see the fish you'll never know whether a fish was eying your fly ready to pounce or you were fishing over dead water. And that lack of knowledge will make you second guess yourself every time you cast. And that'll erode your self-confidence. And that'll lead to doubts about your self-worth and eventually you'll find yourself sitting in your parent's basement, in your underwear, watching reruns of The Andy Griffith Show. Don't fish top water flies if you can't see the fish. Please. Don't Tenkara. Sure you can do that foolishness in the privacy of a small stream. But on a larger river you're going to look like a complete idiot casting a large streamer to a large fish and then dancing around to make that streamer swim.. And then all those "I told you so!" comments that come your way when a modest smallie busts you off and busts your rod will be a chorus of unbearable shame. For the sake of your pride and sanity, Tenkara in private. Well that's about all I'm willing to tell you for now. I hope I won't see you on the water, but if I do, I hope you're fishing where the fish are not. What are your favorite Smallmouth tips? Dave caught this beauty by following six of the seven tips above. That was his first fish on a fly rod. 1 - Though I'm a more legendary bass fisherman than noodler. 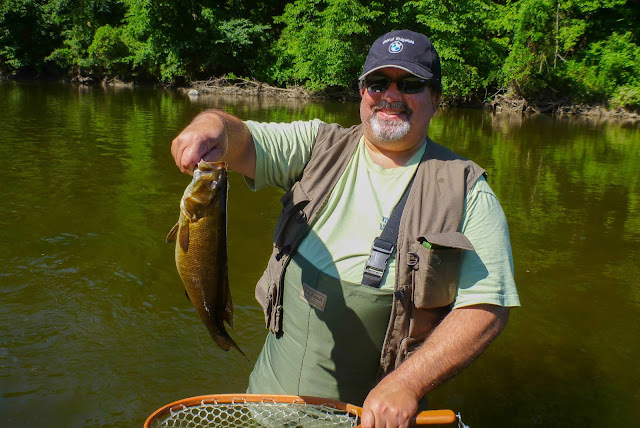 2 - I've intentionally fished for Smallmouth twice. Some would say that's real expertise. Others would mumble and we don't listen to mumblers. 3 - Unless you see a monster swirl there, then take that water. Last Saturday I saw a "head and tail" swirl in six inches of water that made my heart stop. Of course once it restarted I didn't mention it to nobody. Especially not to the guy standing about twenty feet upstream of the swirl fishing the deep run. 4 - Hell, you might even catch a trout. Especially if you target those cold water refuges. They're stacked up like hell in there! Okay, that's not sporting. Don't do that. Intentionally. With weighted treble hooks. That'd just be wrong. Stick to the smallies. 5 - That BS about carp being freshwater bones is just that, BS. Nobody fishes for carp anyway. That's all just more flyfishing carp marketing BS. Don't fall for it. 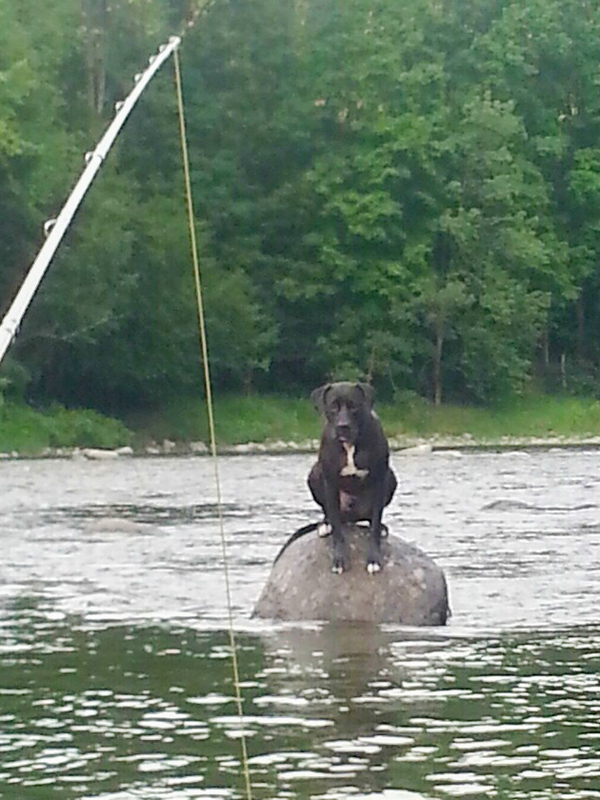 Bonus Tip: Train a dog to spot the fish for you. This is the only reliable way to fish topwater flies when you can't see the fish. Of course, blow a hook set and that dog is gonna give you crap for a long time. Gierach said there's no such thing as a fishing dog. I can't let you have that kind of advantage! Grub and light jighead works with an ultralight spinning setup just as well as a streamer. Great post. That jig action is the trick. Something irresistible to smallmouth. I use a heavily weighted zonked strip - jigs like a champ.